First BMW DCT N54 (335iS) in the 11s and on stock run-flat tires, no meth! Congratulations to KC for being the 1st 335iS DCT car to hit 11s in the 1/4 mile especially given this run was his first time at the dragstrip. The run was done in style with windows down :) OEM Run Flat Tires, FBO, no meth and no DRs! Simply amazing and good luck KC with your N54, you’ve got a strong runner! 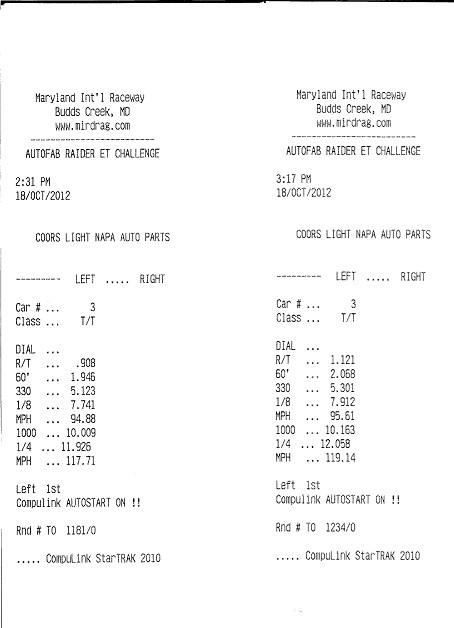 It was done at the Maryland International Raceway (MIR) yesterday, October 18, 2012 with weather conditions making for a DA in the mid 800s. Hey guys! Our group, Bimmer Alliance and AAM customers (GTR’s and a turbo 350z) rented out a lane at Maryland International Raceway today from 9am to 5pm with unlimited runs. We all had a great time and and saw some amazing times put down. I wasn’t nearly as fast as those GTR’s, but I still ran a very respectable 11.92 1/4 on RFTs. Not too shabby for my first time! I did however have the windows down on that run, and should have pulled a 11.8x I think, and I’m gonna beat myself up over that one for a while, haha, but I’m very happy with my time! Special thanks go to PTF for the tune and special attention. Their AWESOME custom Cobb tunes got me where I am today! Do I have the record on stock runflat tires, no meth, no upgraded turbos? ?